Wood, black lacquer, and silver; well hollowed, with a flat lip and recessed flat foot surrounded by a protruding convex footrim; the wooden bottle covered in black lacquer and decorated with an inlaid silver-wire design of blossoming prunus branches and an inscription in seal script with the title ‘Subtle fragrance and sparse shadows’, followed by the date ‘[Made on an] autumn day of the wuzi year’. 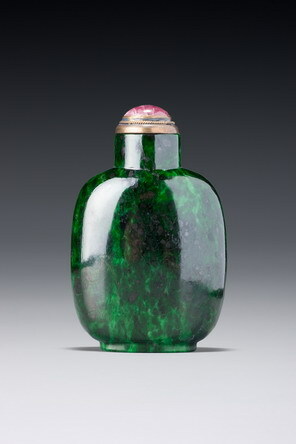 In the snuff bottle world, silver-wire inlay became popular mainly at the end of the Qing dynasty, although there is one extremely rare ebony snuff bottle inlaid with silver wire and turquoise glass that was made in the Qianlong palace workshops; it bears a rare mark saying it was ‘supervised by the Qianlong emperor’ (Meriem Collection, Christie’s, New York, 19 March 2008, lot 223). This appears to have been a northern technique that was revived in the late Qing. The two brothers responsible were Tian Zhimin and Tian Zizheng from Weixian, in Shandong province. They were key artists in the Guangxu-period revival of this art, an art they learned from Yao Xueqian, who was best at imitating Han inlaid gold and silver wares. They also benefitted from the fact that their father, Tian Rongrui (hao: Yufan) worked for Chen Jieqi (1813–1884; also a native of Weixian), one of the most important connoisseurs and collectors of antiquities in the late Qing. The boys were thus provided a solid foundation in archaic designs and scripts. When Yao Xueqian died, Chen loaned his collection of rubbings of seal scripts and bronzes to the Tian brothers to copy. Their studio was situated at the east gate of Weixian during the latter part of the Guangxu period. The excellence of their work brought the brothers far-reaching fame, and Tian Zhimin’s son, Yizhai, carried on the family art into the twentieth century. This seems to have caused a fashion for this sort of inlay, which is reflected in the snuff bottle world by a series of late-Qing snuff bottles, usually of black-lacquered surfaces with silver (and sometimes gold) wire inlay, bearing a number of different names. 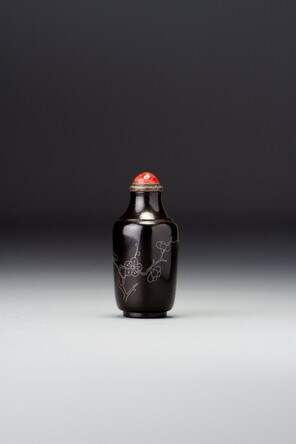 The artists who made the snuff bottles also produced a larger number of spectacular snuff dishes, many of which were fragments of broken Jun-ware pottery from the Song to early Ming dynasties enclosed in a black-lacquered wood frame, with inscriptions, signatures, and dates inlaid in silver and gold. This example bears a date that we can be fairly certain refers to the year 1888, since a date sixty years earlier or later seems highly unlikely. Another example from the collection was Sale 2, lot 134. This bottle was once described as having a separate inset piece of wood as the shoulders and neck. The area is completely covered in lacquer, so it is not evident from the exterior, but the grain is precisely commensurate with it being a single piece of wood, and the interior has no join line at all, so it is probably all one piece. ‘Subtle fragrance’ and ‘sparse shadows’ are extracted from two lines in a poem composed by Lin Bu (see lot 41 in this sale). The poem, ‘A Little Prunus Tree in a Mountain Garden’, gave the world two characterizations of the beauty of prunus blossoms that would forever be associated with the flower. The fact that the prunus was especially esteemed by scholars over the centuries as an emblem of fortitude and spiritual purity makes this snuff bottle one that would have been eagerly sought after among the intelligentsia. A second bottle, with the same decoration, inscription, and date, although differently laid out, was in Sotheby’s, London, 5 December 1983, lot 260.